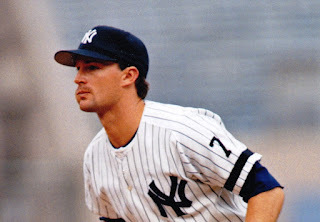 Former Yankees infielder Pat Kelly was in New York recently to help give an assist to the fundraising efforts for the Jason Krause Kick Cancer Scholarship, signing autographs along with his Yankee teammate David Cone at their annual community event. As soon Cone explained to Kelly his endearment for the people who are involved with the organization, he came right on board. Kelly, who played seven of his nine big league seasons with the Yankees from 1991-1997, helped the Yankees transition from a team mired in mediocrity, to one that would rise to dominate the latter part of the 1990s. He credited the late Gene Michael for being the wise architect of the new Yankees dynasty. While serving as the Yankees primary second baseman from 1992-1995, Kelly had the opportunity to mentor a nubile Derek Jeter. He recalled a spring training encounter with Jeter during his early career that caused him question if the Yankees did the right thing in giving Jeter such a large signing bonus. After playing three seasons with Jeter, Kelly quickly changed his tune about their future captain. Taking a moment to reflect on Jeter’s Hall of Fame career, he surmised that he was just proud to be there to help instill the rich Yankee traditions in the young shortstop. While the Yankees were giving Jeter his first taste of the big leagues in 1995, Kelly helped lead the Yankees to their first playoff appearance since 1981. While Kelly scored the go-ahead run in the 11th inning of Game Five of the American League Division Series against the Seattle Mariners, he is probably best remembered for being on base when Jim Leyritz hit his infamous walk-off home run in the 15th inning of Game Two to put the Yankees ahead 2-0 in the series. Kelly battled injuries during the 1996 season, limiting him to only 13 games while the Yankees finally broke through to win the World Series. As exciting as it was for Kelly to be a part of that championship club, little did he imagine just two years later that he would be alongside Mark McGwire as he challenged Babe Ruth’s all-time single season home run record. Signed as a free agent by the St. Louis Cardinals in 1998, Kelly rekindled a long standing friendship with the famed slugger that started when he played alongside another of McGwire’s close friends, Mike Gallego. Kelly detailed how they spent a lot of time together away from the field that most baseball fans aren’t privy to. Being one of McGwire’s confidants on the 1998 Cardinals, Kelly was an eyewitness to the rock star treatment that McGwire received throughout the season. He said it was an unimaginable spectacle for a baseball player. “Playing with him in 1998, it was like hanging out with Elvis or the Beatles; it was a flash mob all the time,” he said. “When we were in Milwaukee, there was nobody at the bar, just out for a quiet drink. Before you knew it there were 2,000 people there, just like that. It was crazy making history like that. Peeling back the curtain of his wild ride with McGwire in 1998, he recalled that McGwire was able to put on his game face every day, but not without enduring the pressure that came with the increasing media attention. Kelly capped his major league career with the Toronto Blue Jays in 1999 and quickly moved to Australia in 2000. He has since worked as an international scout for the Dodgers, helping their operations in the Pacific Rim. It was a career move that he made sure that he took care of before leaving the United States. So who does Kelly think is the next big star that will come from Japan? He quickly singled out two-way player Shohei Ohtani, who is blessed with a 100-MPH fastball and a bat that carried him to over a .300 average for the Nippon Ham Fighters during the past two seasons in the Japan Pacific League. His success comes as little surprise to Kelly, who has watched Ohtani since he was in high school. The larger quandary Ohtani presents for MLB executives is how they can take advantage of both his powerful bat and pitching arm.